The celebration of our Final Vows took place in a very quiet and attentive environment so the real presence of many Sisters of our Priory and the Sisters and Brothers of other Congregations, as well as our families and friends, were tuned in with the presence of those who make us feel their presence through prayer and the many letters and cards. In fact, your prayerful presence touched us during the six months of our preparation. We were together on a daily basis, the three of us and Sr. Veronica Pietro from Argentina. 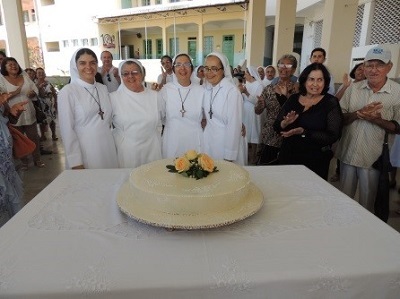 We listened very carefully to the classes given to us in preparation for our Final Profession and which were so well prepared by our sisters from the Olinda Priory, namely: Sr. Hildegardis Nassen, Sr. Madalena Mendonça, Sr. Ursula Worringen, Sr. Lucida Schmieder and Mother Vania Maria Toscano, whom we thank with all our hearts for the time they dedicated to each one of us, including the time given for personal listening, guidance and prayer. Thank you very much, especially dear Mother Angela for having accepted us to belong, throughout our lives, to this family of Missionary Benedictine Sisters of Tutzing. The day of our profession was the culmination of a God experience, which developed gradually and fortified us to give our lives. This experience started at the beginning of our Christian life with baptismal consecration. The Eucharistic Celebration was presided by Fr. Emanuel d’Able do Amaral, Archabbot of São Sebastião Monastery in Bahia, concelebrated by Fr. Luis Pedro, Prior of S. Bento from Olinda, PE., Fr. Carlos Alberto de Holanda, Redemptorist, parish priest in Teresina - PI, Fr. 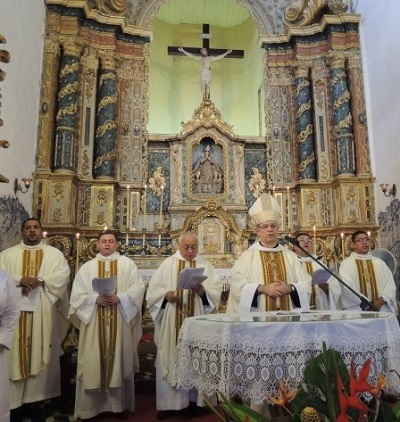 Carlos Eduardo Pereira Santos from S. Felix Parish in Buíque-PE (pictured left), Fr. Bruno Carneiro, Chaplain of the Dorotéias Sisters (our neighbors), and Fr. Antonio Ferreira da Silva of Santa Clara’s Parish in Tupanatinga-PE, (pictured right). We noted also the presence of Fr. Julio Miguel (Redemptorist) of the Nossa Senhora da Conceição Chapel in Ibura neighborhood, whose commitments caused a little bit of delay at Mass. In addition to the Sisters of our communities of the Priory, and the others already mentioned, we also feel the strengthening and prayerful presence of many representatives of our Parish communities of origin. 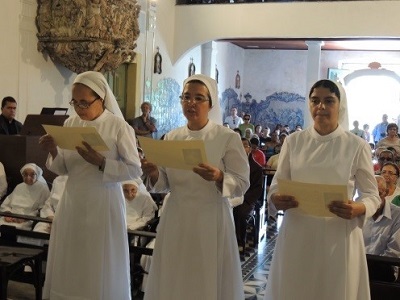 We thank the community groups of Ibura-Recife and the Parishes of Pesqueira and Buique who made a great effort to come, demonstrating zeal for our vocation, which was born in their midst. Everything was so beautiful and significant that it's hard to describe. We can only be grateful. The ceremony was touching for many persons. Some faces were filled with tears of emotion, that made us realized in us and in others, how much they were in concord with the God of life, the God Who calls His children to a life of total service of the Gospel among the people. Moreover, this has been clearly expressed in the song chosen for the 'Rite of Missionary Sending', which we want to repeat here in the form of prayer: "Lord, you called me from the midst of the people ... What I wanted more than anything ... help me to make my people happy." With this letter and a few photos, we want to once again thank you all, and humbly ask you to continue to pray for us. Do not forget to join us on our journey, and do not forget to ask the Lord of the harvest to send new workers into His harvest that is so great and so lacking in young forces to announce the Good News of Salvation to the ends of the Earth. With this same thankful heart and recognition of His closeness and friendship, praise the Lord!